The Newsboys are one of Australia's most popular exports. This collection of worship songs includes such powerful tracks as 'He Reigns' and 'You Are My King (Amazing Love).' Producer Steve Taylor brings out the best in the Newsboys once more! About "Adoration: The Worship Album"
Customer Reviews For "Adoration: The Worship Album"
This album is amazing. An absolute must have, you will be hooked from the very first song "He Reigns". 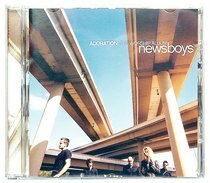 This album is characteristic of the straight-forward uncompromising call to authentic Christianity for which Newsboys are famous for. Without a doubt, these songs will definately become permanent fixtures in your own worship line-up.